Cricket researcher Geoff Levett, whose Master’s thesis was entitled “Constructing Imperial Identity: The South African Cricket Tour of 1907,” believes that the origin of the term used above to describe the quartet of “mystery” spinners from South Africa in the first decade of the 20th century can be attributed to first-class cricketer and well-known columnist EHD Sewell, born of English parents in Lingsugur, a municipal town in the Raichur district of Karnataka. Sewell, who would later return to India under the auspices of the Indian Civil Service in 1892, marry a lady born in Darjeeling, and play a fair amount of first-class cricket in India, was reasonably proficient in Hindustani, the British term for the local Hindi language, then a mandatory requirement for all Englishmen serving in the Indian Civil Service. The term “Oolta -Poolta,” as some may know, means “upside down” in Hindi. In a way, this story represents a confluence, at strategic times, of several seemingly disparate threads that run concurrently through the narrative, and merge at certain points to make the saga coherent and meaningful. Let us consider the different issues involved in chronological order to the extent possible. In all fairness to the dramatis personae involved, the tale must begin at Blue Cross, a hamlet in the London Borough of Enfield, on 13 Oct/1877, almost exactly seven months after the first ever Test match had got underway at the Melbourne Cricket Ground, the historical date then being 15 March/1877. The story begins with the birth of one Bernard James Tindall in a well-to-do family, the eldest of the five children of Bernard Tindall Bosanquet and his wife, Eva Maude, nee Cotton. Bernard, later to be known popularly as “Bosey,” took to cricket quite early in his life. He was also fond of a game called Twisti-Twosti in which there would be two players involved, each standing at one end of the table. One of the players would bounce the ball across the surface of the table, and the other would be required to catch it. The object of the exercise would be to devise means by which the ball would evade the grasping hands of the opponent. The story of how Bosanquet, originally a purveyor of brisk fast-medium bowling, honed his new-found skill while at Oxford, and later while turning out for Middlesex in 1900, and of how he confounded the Australians on the 1903/04 Antipodean tour and later on the 1904 Australian tour to England, is too well-known to be repeated here. 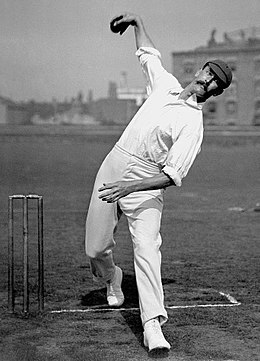 While the rest of the cricket-playing world referred to the new weapon in the wrist-spinner’s arsenal, described as being “an off break, delivered with a leg break action from the back rather than from the front of the hand'” as a “googly”, the Australians, who had been on the receiving end in the Test matches in which Bosanquet played, preferred to call it the “bosey” in honour of the inventor of the new technique. The next major player in the narrative was born on 4 May/1875 at Lee, Kent, the son of Robert George Schwarz, a merchant of West Kensington, and of Bagshot, Surrey. Christened Reginald Oscar, he was educated at St. Paul’s School, London, going up to Christ’s College, Cambridge, in April/1893. While at Cambridge, he excelled at rugby, winning his Blue in his freshman year, and later earning 3 England caps. While Schwarz also played cricket, he did not receive his Blue in the game. Schwarz played 2 matches for Middlesex alongside Bosanquet in the 1901 English season, mainly as a right-hand batsman who bowled right-arm medium pace on occasion. Persuaded by Bosanquet to be part of the Bosanquet XI team that toured North America in late 1901, Schwarz played 2 first-class matches against the Gentlemen of Philadelphia on the tour as a batsman. While the tourists won the first game by 61 runs, the hosts won the second by a substantial 229 runs, with local right-arm fast-medium bowler Percy Clark capturing 5 wickets off 7 deliveries in his ultimate analysis of 11.5-4-22-7 to finish the game. At the end of the 1902 English season, having played 13 matches in total for Middlesex, Schwarz emigrated to South Africa and settled in Johannesburg in the capacity of Company Secretary, along with Yorkshireman Frank Mitchell, later to captain South Africa at cricket, to Sir Abe Bailey, South African entrepreneur extraordinaire, and one of the principle early benefactors of South African cricket along with Cecil Rhodes and James Douglas Logan. Schwarz played his first Currie Cup match representing Transvaal against Griqualand West at Port Elizabeth from 6 April/1903. When a 15-member South Africa team embarked for England in the summer of 1904 under Frank Mitchell to play first-class cricket but no Test matches, Reggie Schwarz was one of their number, selected principally for his batting skills. In the larger context of this narrative, the 1904 tour, largely financed from the bountiful coffers of Sir Abe Bailey, was to be pivotal for the events to follow. The visitors opened their tour against a strong MCC team led by WG Grace, and containing such luminaries as Archie MacLaren, and Reg Spooner, in addition to the Australians Albert Trott and Frank Tarrant. The 3-day game was severely curtailed by rain, and only 1 day’s play was possible. Winning the toss, South Africa batted first and were bowled out for 194 from 55.1 overs, with “Buck” Llewellyn, a cricketer of mixed parentage, remaining unbeaten on 68. Bosanquet had figures of 9/107, his best for the season. Bosanquet’s bowling proved to be a revelation for the South Africans. Schwarz was by now sufficiently intrigued by Bosanquet’s innovation to prevail upon his friendship with the latter to discuss the technicalities of the new delivery with him. From tips that Bosanquet shared, Schwarz began to practice the art himself at the nets. By the time the 4th match of the tour was played, against Oxford at The Parks in early June, he felt that it was worthwhile to try out the skill in match play. Not brought on to bowl during the Oxford 1st innings of 154 all out, Schwarz was summoned as the 4th option in the undergrad 2nd innings and won the match for South Africa with figures of 7.2-0-27-5. He ended up with 97 wickets in all matches at 14.81 on the tour, with 8 five-wicket hauls and 12 wickets in one game. A grain of an idea had been planted in his mind, and the friendly tips imparted so freely by Bosanquet during the 1904 tour would come back to haunt the Englishmen at a later date. At this point, let us pause to consider the impact that the googly had been making upon the public and among the players of the era. The reactions were varied. Writing for Wisden, Simon Wilde quotes Bosanquet himself saying: “It is not unfair, only immoral.” The batsmen of the day, mostly amateur cricketers who played cricket for the love of the game reacted with various degrees of “ridicule, abuse, contempt, and incredulity.” Over time, however, batsmen began to be wary of the new weapon. Back in South Africa, Schwarz decided to put his new-found knowledge to good use, realising the potential of the googly as a wicket-taking delivery, particularly on the relatively dry up country wickets of Johannesburg and Kimberley, where the surface used to consist of heavily rolled gravel covered by matting. Having considered all angles, Schwarz felt it would be best if he could impart his recently learnt skills to other South African bowlers. Gordon White, better known for his batting, and a fellow-member of the 1904 touring team, was enthusiastic, as was Aubrey Faulkner, the South African all-rounder par excellence. Bert Vogler grew up to be a right-handed all-rounder, usually batting in the middle order, and bowling right-arm medium-pace. His first documented cricket match was a 3-day game between 15 of Natal and 11 of the 1902 Australians, played at Lord’s, Durban, from 25 Oct/1902. In a drawn game, Vogler took 4 wickets over the 2 innings and scored 7 in his only innings. The stand-out performance of the match was from Australian right-arm medium-pace bowler Bill Howell, who had figures of 11/79 from his 34 overs in the Natal 1st innings total of 206 all out, with 5 of his victims being bowled. Two more games for Transvaal, where he was now a team-mate of Schwarz, followed in November and December of 1904, but Vogler had very limited success in them. He decided to relocate to England and turn professional, doing so by the time the English season began in 1905. Wisden has the details of this move by Vogler, and makes the following observation: “Going to live in Pretoria, he decided in 1905 to adopt cricket as a profession, and came to England with the intention of qualifying for Middlesex. He obtained an engagement on the M.C.C. ground staff, and in his second year at Lord's bowled on several occasions for the M.C.C. with brilliant success. The idea of Vogler qualifying for Middlesex aroused some feeling in 1906, the metropolitan county having already two Colonial players, Albert Trott and Frank Tarrant. Happily, any friction which might have arisen disappeared, Sir Abe Bailey finding a position for him.” It was thus that the far-sighted Sir Abe Bailey netted two of the prominent exponents of the new googly, Schwarz and Vogler, in his seemingly bottomless payroll. When an English team embarked for South Africa in the winter of 1905, it was the 5th Test playing tour of South Africa by the Home Country, but, significantly, the first under the auspices of the MCC. History tells us that the first choice for the captaincy role had been the tall and stately Winchester College and Kent cricketer John Richard Mason who had been sounded out as early as the first week to July, but who had declined for personal reasons. “Plum” Warner was then chosen for the job. It was not a very pleasant tour for the Englishmen. In his book Long Innings, Warner was to later remark: "Our programme was a heavy one. Between December 2 and April 2, we played twenty-six matches, which meant sixty-six days' cricket and travelled 6348 miles by railway, in addition to a sea voyage between Durban and East London. No fewer than twenty-two nights were spent in the train." To add to the travel travails, the Englishmen, admittedly not at full strength, and unaccustomed to the relatively dry, hard matting wickets, went down 1-4 in the 5-Test series, bowing to the wiles of the South African spinners. The “Oolta-Poolta” South African spin quartet were in their elements. Although essentially, they were all leg-spin and googly bowlers, they were not all exact copies of the prototype. Schwarz bowled googlies almost exclusively. Vogler had more variations, with his mixture of quickish orthodox leg-breaks, googlies, the occasional traditional off-break, and fast yorkers to confuse the batsmen. All-rounder Faulkner resorted to slow-medium leg-breaks and googlies delivered at an impeccable length and tantalising variations in flight, in addition to a well-concealed fast yorker that could move either way. Although White was more of a batsman, and did not have the same command over line and length, his googly was reported to be more difficult to read. All four were more than capable batsmen as well, and the team was led by wicketkeeper Percy Sherwell, who batted at # 11. There were six Test debutants for South Africa in the 1st Test match in Gordon White, Sibley John “Tip” Snooke, Aubrey Faulkner, Bert Vogler, Reggie Schwarz and skipper Percy Sherwell, the members of the spin quartet each playing his respective first Test match. Well, South Africa won the 1st Test at the Old Wanderers Stadium, played from 2 Jan/1906, by 1 wicket, the scheduled 4-day match ending on the 3rd day. The home spin quartet captured 14 of the 20 opposition wickets, and gave the visitors much to ponder over. The 2nd innings efforts of Gordon White’s 81 and Dave Nourse’s 93* proved to be vital factors in the first ever home Test victory by South Africa against an English team. The unfinished last wicket partnership of 48 runs between Nourse (93*) and Sherwell (22*) set a new Test record for being the highest 10th wicket stand in the 4th innings in a winning cause. At the present time, this partnership lies in the 3rd position in the all-time list. The invaluable Test database of Charles Davis informs us that the over distribution over the 3 days of the Test was: 99-91-90.5. For an average of 5-6 hours of match play per day, the over-rate appears to have been fairly brisk. Bert Vogler spun himself into the record books on his debut. Brought on # 4 in the bowling sequence in the England 1st innings, Vogler dismissed middle-order batsman Ernie Hayes caught-and-bowled with his very first delivery in Test cricket, the first South African to achieve this remarkable feat. 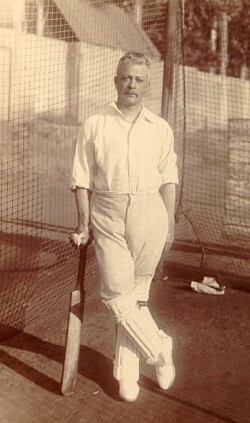 Interestingly, another debutant in the same Test, Jack Crawford of England, repaid the compliment by dismissing Vogler with his own very first ball in Test cricket, a unique combination of events in Test history. Till date, the only other South African bowlers to have taken a wicket with their respective first balls in Test cricket have been Dane Peidt, with the wicket of the Zimbabwe batsman Mark Vermeulen in the 1st Test at Harare in Aug/2014, and Hardus Viljoen, with the wicket of England skipper Alistair Cook in the 3rd Test at Johannesburg, in mid-January/2016. There was a 2-month gap before the 2nd Test was played at the same venue from 6 March/1906, and the Englishmen had an extended opportunity to acclimatise themselves to the unaccustomed weather and pitch conditions. South Africa won this Test quite conclusively by 9 wickets, the match again ending on the 3rd day with White finishing things off with a boundary 4. This time the spinners captured 10 of the wickets to fall in the match, the other 10 going to their quicker men, Tip Snooke and Jimmy Sinclair, left-handed all-rounder and medium paced bowler Dave Nourse bowling in both innings but going wicketless in the match. Surprisingly, the 3rd Test was scheduled to begin at the same venue on the Saturday, 10 March/1906, of the same week. It was only the fact that the 2nd Test had ended 1 day ahead of schedule that gave the players a gap of 1 day between Test matches. One can imagine modern day players and organisers shaking their heads incredulously at this unusual bit of scheduling. Sherwell won the toss and South Africa batted first, putting up a creditable 1st innings total of 385 all out. Middle-order batsman Maitland Hathorn was the star of the innings with his 102 from 145 balls faced in 170 minutes, the innings containing 15 fours. There was no one with a single-digit score in the innings, Vogler, the last man in, contributed 28*, and extras chipped in with 25. Surrey right-arm fast-medium bowler Walter Lees captured 6/78. England replied with 295 all out, with Fred Fane scoring a vital 143 off 265 deliveries faced, and embellished with 17 fours. The value of Fane’s innings lay in the partnerships he was able to forge: 35 for the 3rd wicket with skipper Warner (19), 84 for the 4th wicket with wicketkeeper Len Moon (36), 88 for the 5th wicket with Ernie Hayes (35), and 57 for the 6th wicket with Albert Relf (33). Fane himself was the 6th man dismissed, at the total of 280, and the next 4 wickets added only 15 more runs. South Africa began their 2nd innings with a 90-run advantage on the 1st innings, and began to score rapidly. The splendid century (147 runs from 250 balls faced, with 19 fours and 2 sixes) by the one-drop man Gordon White set the pace. His 2nd wicket stand with opener Louis Tancred (73) realised 110 runs in 85 minutes, whilst his 3rd wicket partnership of 120 runs with Dave Nourse (55) came in just over 2 hours. The 4th wicket collaboration with Jimmy Sinclair (48) produced 87 runs in only 35 minutes of mayhem. South Africa declared their 2nd innings closed late on the third day at 349/5. Even in the face of this run-feast, Lees took 3/85 from his 26 overs. The day ended with England 14/2 in 7 overs in their 2nd innings, and the deficit was still 425 runs. England capitulated on the fourth day to be all out for 196, the only individual innings of any substance coming from the bats of David Denton (61, the only fifty of the innings) and Jack Crawford (34). South Africa won the Test in commanding fashion by 243 runs. In a departure from the trend of the previous 2 Tests, home quick bowler Tip Snooke returned figures of 4/57 and 8/70, a stand-out performance. At this point, South Africa were leading the series 3-0. The 4th and 5th Test matches were played consecutively at Newlands, Cape Town. Although originally billed as being a 4-day Test, the 4th Test, which began on the Saturday, 24 March/1906, was over on the 3rd day with England the deserving victors by 4 wickets. The undoubted hero for England was the slow left-arm orthodox bowler Colin Blythe with match figures of 6/68 and 5/50, opening the attack in both innings. Gordon White played a heroic knock of 73 in the South African 2nd innings total of 138 all out, adding to his 41 in the 1st innings total of 218 all out. The series now stood at 3-1 in favour of the home team. The 5th and last Test began on a Friday, 30 March/1906, and much of the glory of South Africa winning it by an innings and 16 runs was consequest upon a batting feat by Bert Vogler. After England had been dismissed for 187 in their 1st innings, with Sinclair picking up 4/45, South Africa ended the first day on 87/4, exactly 100 runs behind. Things did not go very well for the home team on the next day, despite a patient 60 from Snooke in 110 minutes. At the fall of the 9th wicket, that of Snooke, the South African total read 239, a lead of 52 runs. Bert Vogler, the last man in, joined his skipper, Sherwell, who was yet to open his account. Incredibly, the last pair added 94 runs for the 10th wicket, the partnership ending with the dismissal of skipper Sherwell (30, scored in 95 minutes, with 3 fours). When the innings ended at 333, Vogler was unbeaten on 62 (in 73 minutes, with 5 fours and 3 sixes), the highest individual score of the innings. The 94-run last wicket partnership was the highest for South Africa in Test cricket at the time, and is still the 3rd highest for South Africa after the unbroken 107 run stand between AB de Villiers (278*) and Morne Morkel (35*) against Pakistan at Abu Dhabi in Nov/2010, and the 103-run stand between “Tuppy” Owen-Smith (129) and “Sandy” Bell (26*) against England at Leeds in July/1929. Bert Vogler’s 62* remains the highest individual Test score by a # 11 batsman for South Africa till date, and the 6th highest ever score by any # 11 batsman in a Test match.